This is not a discussion about the benefits of CrossFit. In fact you would be hard pressed to call me a CrossFitter. I have only participated in a small handful of classes since its mainstream introduction. This sport is not something that I regularly participate in or is it something I generally advocate to others. This makes it a strange topic for me to discuss. However, I do see it as another form of exercise to help individuals achieve their fitness goals and improve their overall health. CrossFit has received a large amount of public bashing since its mainstream introduction to the fitness industry. This bashing is generally around the 'high rate of injuries' associated with CrossFit. Its sometimes unusual and uncommon exercises that are completed in their WODs (workout of the day) tend to make it an easy target. With the amount of attention it receives you would think it was the most dangerous sport on earth. Rather than giving my opinion as I often see others do in online social media, I thought I would present this recent study that was published. It screened and followed 117 CrossFit participants for 12 weeks to see what the rate of injury would be. They found that the injury rate was only 2.10 per 1000 training hours. 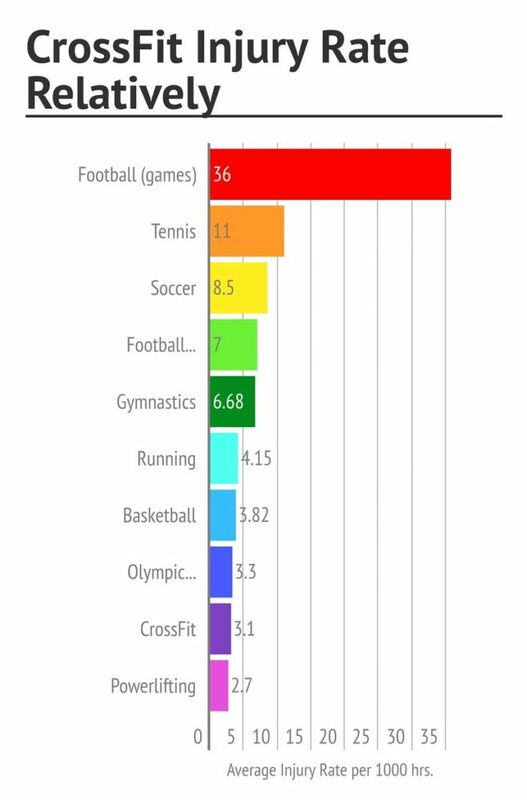 When you consider the injury rate of other sports (particularly contact) this is comparatively low. In fact Powerlifting and Olympic lifting had extremely similar injury rates. Quite amusing, seeming that it is usually the 'gym rats' who bash CrossFit. If you think it is just one study and the numbers could be wrong then I should mention this study is not alone. There are other studies out there that show similar numbers, although they do lack the integrity of high quality research. To draw more clear conclusions about the given evidence I provided a couple of graphs below for observable comparison. 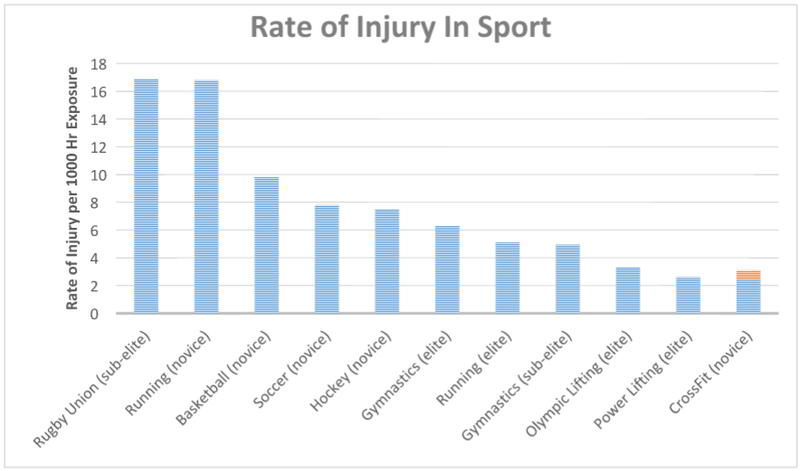 The two graphs above compare the rate of injury for each sport per 1000 hours of participation. These graphs come from two different anecdotal studies and give similar injury occurrences as the main study discussed. Obviously more high quality research is required to give a clear cut statement on the issue. Still there are grounds to believe that CrossFit is not as dangerous as we think it is (although it may look silly from time to time). At the end of the day do what you enjoy. Everything in life comes with risk, just be smart about what you're doing and how you prepare for it. Some people take higher risks than others. The only time you'll see me as a clinician tell someone to not participate in CrossFit would be if they are already injured and need time to rehabilitate or if it sounds like they aren't getting the appropriate coaching. If anyone reading this has injuries or issues they would like to discuss with me, CrossFit or not, I am happy to sit down and talk to you about them. As always you can find me at Braydon Vo Physiotherapy located inside World Gym North Lakes.